Please select an option Grey Blue starry Geo blue Pink camouflage Blue camouflage Geo Please select a color. INSTANT COOLING, REUSABLE - quickly cools down by just soaking, wringing the water out and snapping. The magical cooling effect can last up to several hours and easy to reactivate it by repeating the same steps. The unique cooling system uses moisture from the towel to draw the sweat away from your skin to keep you cool. Everyone can use the cooling towel, even pets. FASHION, COMFORTABLE FIT - provides a pleasing color scheme, decent size (40""x12""-large enough to meet your needs) and lightweight. It has a soft feel and attractive to use in public and a perfect size to be a towel, scarf, headband and bandana. It's just the right size to wrap around your neck or head. The edges are smoothly finished and the exquisite stitching prevents the 4 semicircular corners from unraveling. Use them any place it is hot and you need to cool down to be comfortable. ECO-FRIENDLY(RoHS APPROVED), VERSATILE - works on the physical evaporation of moisture. No chemicals are used in the making of the cooling towels. It's perfect for hot flashes, outdoor activities, indoor exercise, fever or headache therapy, heatstroke prevention, sunscreen protection, cooling while absorbing. Keep yourself cool during hot summer days, workout sessions, outdoor adventures or when someone has a migraine. TOP QUALITY, GREAT GIFT - Softcool Extreme material, dries soft and doesn't drip water. It would be a thoughtful and caring gift for your families or friends who are heavy sweating, sports enthusiasts, kitchen staff, outside workers, mom with baby. Perfect for vacations to hot places or if you work outdoors in the heat and need a quick cool down, it absorbs heat or sweat pretty quickly and takes a fair amount of time to lose its cooling effect but just snap it in the air and it gets it all back. BONUSE - nice portable pouch(CE APPROVED). 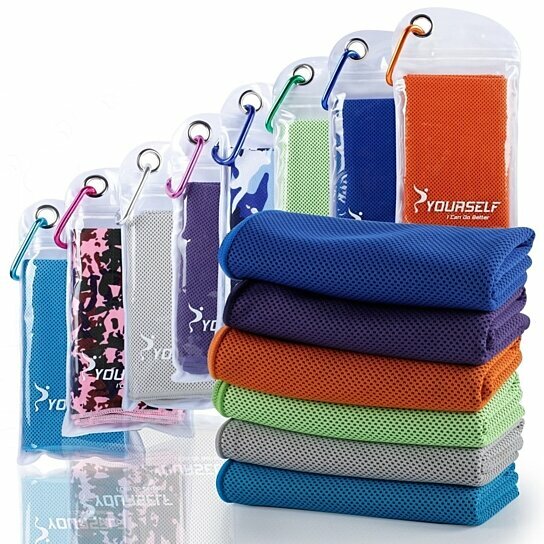 It comes in a FREE waterproof carrying pouch along with a carabiner to attach or fit into your bag, which takes up a little room and weighs a little in your backpack or your purse when you are planning on a travel or outdoor activity.